The activities of the Fund are vast and include the active participation in numerous conservation, rehabilitation and wildlife protection programs. Our primary goal is to preserve the wildlife habitat, along with the biodiversity of fauna and flora of the land we own and/or utilise. We have long realised, that we needed to put our money where our mouth is and every Rand invested by the Fund donors and our membership, is used as effectively and efficiently as possible. Expanding human populations and encroachment into previously managed wildlife areas has caused the fragmentation of our wildlife habitats, bringing man and beast into conflict on a more regular basis with one another. Through our membership, large tracts of land has been preserved as both economically and ecologically viable units, often in marginal or semi-arid agricultural areas. Land protection and future acquisition, along with the conversion of sustainable wildlife management areas is vital, for the survival of our wildlife in Africa. Habitat destruction and fragmentation is a death sentence to our wildlife. Hunting, is one of the most important wildlife management tools available in the remote rural areas of the country for our food security and long term economic survival of those land owners and employees in the region, where no other alternative employment opportunities exist. Previously we have supported WESSA, EWT, Wildlands Conservation Trust, Zululand Rhino Reserve and the South African National Parks with their conservation projects and anti-poaching initiatives. Our message is well documented in our “A Conservationist’s Cry” video, a presentation that was made for distribution at the COP17 CITES Convention in 2016. The war against Rhino poaching rages on with about 100 000 Rhinos having been poached since the CITES ban of 1977 and it if therefore that PHASA Conservation & Empowerment Fund supports anti-poaching units e.g. the KZN K9 Unit. Established and managed by Duncan Paul a life member of the association. The initial R1.4 million project was funded 100% from hunter’s donations. With additional financial support from the PHASA FUND, two more dogs and handlers have been added to the field operational unit. Funding is urgently required to keep this K9 Unit in the field. A number of celebrities (including Prince William & David Beckham) have voiced their opinions and pledged their support in the fight against rhino poaching. However, the most successful weapon in use against these poachers is the Kruger National Park (KNP) anti-poaching dog unit. The Fund supports the Kruger Park K9 Anti-Poaching Project as these dogs play a vital role in the Conservation of our Wildlife especially in protecting our Rhino against poachers. The Fund, a long-time supporter of the rhino anti-poaching program will facilitate any donor funding to the dog unit, in the form of “Dog Packs” to specifically support these dogs with medical first aid assistance when injured in the line of duty. A BIG thank you to GMT Foods for the very generous donation of Montego Dogfood and to Dallas Safari Club for their donation to WESSA and the KZN K9 dog unit. KNP tracker dog attacked by a Kudu near Letaba and airlifted to West Acres Animal Hospital in Nelspruit. Vultures form an important ecological component of our natural environment, cleaning up dead carcasses and decreasing the spread of some diseases. The relationship between vultures and people is also a venerable one. Today, vultures face an unprecedented onslaught from human activities. They have to cope with electrocutions and collisions with electrical structures, poisonings, land-use changes, a decrease in food availability and exposure to toxicity through veterinary drugs, to list just a few of some of the challenges facing vultures today. VulPro approaches vulture conservation in an integrated, multidisciplinary fashion, with the benefits from the programme accruing to both vultures and society at large. VulPro combines education and good science, with networking, capacity building and knowledge generation. The veterinary disciplines of toxicology, pharmacology, clinical pathology and medicine are combined with the science of GSM/GPS telemetry and the banking of genetic and DNA resources, with the goal being to positively influence the well-being of our natural resources to ultimately benefit society. In this regard, VulPro engages in a number of interrelated activities, and uses a variety of resources, in endeavouring to meet its objectives. Most of our members are keen fishermen and many have fished and hunted along the shores of Pongolapoort or Jozini Dam. We are not only concerned about the future of hunting but also the future of Tiger Fish, an endemic species with a limited distribution in South Africa and listed as a TOPs species. 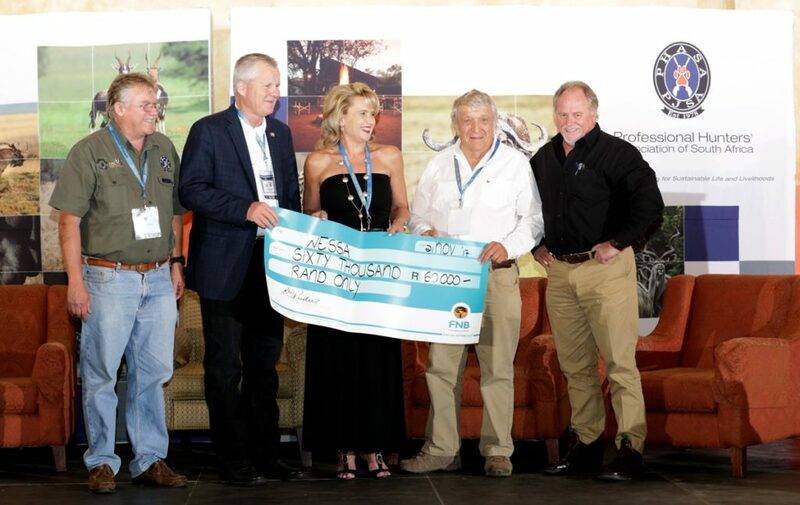 The FUND has decided to sponsor the South African Police Services Waterwing Task Team in support of their anti-poaching and gill netting operations in the area. These operations have accounted for many illegals boats/crafts and over 23 kilometres of gill nets seized and destroyed. These operations will hopefully secure the future of our children’s heritage. The PHASA FUND thanks the dedicated SAPS Waterwing Task Force members for their dedicated efforts to reduce poaching and gill netting in and around Jozini Dam. We support your efforts.